“The Nightmare” by Henry Fuseli 1781. “Wait. R.E.M. and waking stages combine? or threatening assailants while responses lag? Doc, what about out-of-body experiences? This all happens monthly, so what’s the plan? I liked my discovery of unexpected rhymes here. I’m picking up frequencies of Dante’s Inferno in this (is that why there are quotes around Dan? ), or, at least, that kind of venturing into a living hell. I’m confused by the word ‘monthly’, though. Thanks! Your comment is very helpful. It’s really good to know where I’ve connected and where I may have flopped. I’m embarrassed that I have not yet read Dante’s Inferno. I can’t say I was inspired by it, though sleep paralysis is definitely a type of hell for the sufferer. I was inspired by the prompt, the R.E.M. song that (presumably) inspired the prompt, and the assault on Dan Rather that inspired the song. I picked “monthly” arbitrarily. 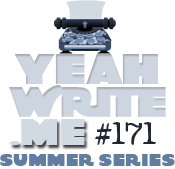 An earlier draft had Dan suffering from sleep paralysis semi-annually, though that hardly seemed frequent enough to justify Dan seeking medical advice. Your answer is very well written, maybe it’s just a hard concept to get across in 42 words? I knew you were referencing Dan Rather and R.E.M. Just not sure how monthly bouts of sleep paralysis entered into the storyline or how that relates to the title and the picture (which is where I think I got Dante’s Inferno). For what it’s worth I think everything I said about your entry applies to my own. This was a tough prompt! The title is both a reference to one of Rather’s controversial sign-offs as well as (snarky) advice for sleep paralysis sufferers. The title is in quotes for both reasons. 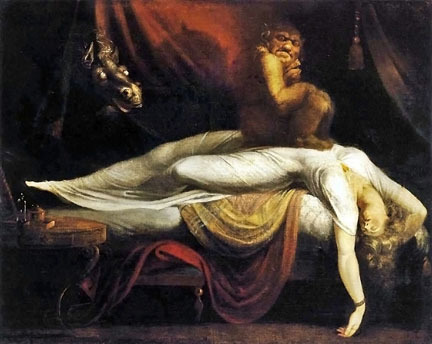 The picture is a depiction of a nightmare sitting on the sleeper’s chest which is one of the symptoms of sleep paralysis. I’m not sure how to address your confusion about how monthly bouts of sleep paralysis entered into the storyline because that is (most of) my story. It’s fiction, it’s not meant as a retelling of Dan’s very real attack but an alternative that maybe he imagined the whole thing because he suffers from sleep disorders and finally goes to a doc to get it checked it out and the doc gets his name wrong – a famous news anchor – completely botched. LOL. Anyway, I’m sorry this didn’t connect the way I had hoped. 😦 But I really appreciate your comments. I should probably join the Bronze lounge. Are you registered there? Crap, Melanie, I was thinking you were already in the bronze lounge with us. I wouldn’t have been so blunt with my opinion if I had realized. I try to only give feedback when it is requested from me. That’s what I think is hard about this prompt: there’s two strong associations (Dan Rather and REM) to it and not many avenues to travel down. I somehow never heard of the Dan Rather connection to this song–it was very interesting to read the backstory to a song I’ve known for so long. I didn’t know about sleep paralysis, either, so all in all I found your Gargleblaster to be fascinating and thought-provoking. Thanks! I’m glad it came across chatty! LOL, so maybe I shouldn’t bother reading Dante’s inferno? I’m glad you liked the sounds! Thanks for commenting! “By the way, I’m ‘Dan'” — LOL. That would’ve been a hilarious response by Dan Rather to his attackers — though the attack was not at all funny. Maybe the sitcom version of it, then.